Alcohol proof is a measure of the content of ethanol (alcohol) in an alcoholic beverage. The term was originally used in the United Kingdom and was equal to about 1.821 times the alcohol by volume (ABV). The UK now uses the ABV standard instead of alcohol proof. In the United States, alcohol proof is defined as twice the percentage of ABV. The measurement of alcohol content and the statement of content on bottles of alcoholic beverages is regulated by law in many countries. The term proof dates back to 16th century England, when spirits were taxed at different rates depending on their alcohol content. Spirits were tested by soaking a pellet of gunpowder in them. If the gunpowder could still burn, the spirits were rated above proof and taxed at a higher rate. 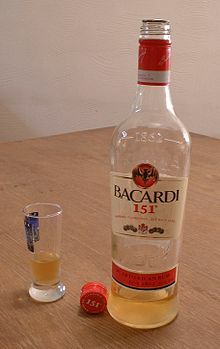 As gunpowder would not burn if soaked in rum that contained less than 57.15% ABV, rum that contained this percentage of alcohol was defined as having 100 degrees proof. The gunpowder test was officially replaced by a specific gravity test in 1816. From the 19th century until 1 January 1980, the UK measured alcohol content by proof spirit, defined as spirit with a gravity of ​12⁄13 that of water, or 923 kg/m3, and equivalent to 57.15% ABV. The value 57.15% is very close to the fraction ​4⁄7 ≈ 0.5714. This led to the definition that 100° proof spirit has an ABV of ​4⁄7. From this it follows that, to convert the ABV expressed as a percentage to degrees proof, it is only necessary to multiply the ABV by ​7⁄4 . Thus pure 100% alcohol will have 100×(​7⁄4) = 175° proof, and a spirit containing 40% ABV will have 40×(​7⁄4) = 70° proof. The use of proof as a measure of alcohol content is now mostly historical. Today, liquor is sold in most locations with labels that state its alcohol content as a percentage of alcohol by volume (ABV). In common with other EU countries, on 1 January, 1980, Britain adopted the system of measurement recommended by the International Organisation of Legal Metrology, a body with most major nations among its members. The OIML system measures alcohol strength as a percentage of alcohol by volume at a temperature of 20 °C. It replaced the Sikes system of measuring the proof strength of spirits, which had been used in Britain for over 160 years. Britain, which used to use the Sikes scale to display proof, now uses the European scale set down by the International Organization of Legal Metrology (OIML). This scale, for all intents and purposes the same as the Gay-Lussac scale (GL) previously used by much of mainland Europe, was adopted by all the countries in the European Community in 1980. Using the OIML scale or the GL scale is essentially the same as measuring alcohol by volume except that the figures in the latter case are expressed in degrees, not percentages and measured at a temperature of 15 °C. Canada labels by percentage of alcohol by volume. The old UK proof standard was still in use as late as 1972. ^ a b c Jensen, William. "The Origin of Alcohol "Proof"" (PDF). Archived from the original (PDF) on 8 July 2014. Retrieved 17 July 2014.